How about a SatNav Treasure Hunt? At Dungannon Motor Club we are always trying to think of new ways for Club Members to have fun in their cars, and here we are going to test an idea how to have fun with our SatNavs. Many people have one in their road car these days as standard, or you might have one of those Tom Tom or Garmin devices that stick to the windscreen (or know somebody who does and would lend it to you!). Failing that, if you have an iPhone or similar, there will be turn by turn directions available using Google Maps, or Apple Maps. So we thought, why not try to come up with a way to use these as part of some kind of event. As motor sport people, we are familiar with map references, and these have been the cornerstone of navigation rallying since the sport began. A GPS co-ordinate is basically the same thing. Here is our idea: we give folks a list of GPS co-ordinates and they can visit them in any order they want. At each location there will be a question to be answered and recorded, just like a Treasure Hunt. To help with this, a diagram will show the relative positions of the co-ordinates so each participant can plan the order in which they will visit them. The route is not important, only the individual destinations. Participants input the GPS co-ordinates and let their SatNav take them to the point. No map reading; no following tulip diagrams; no route instructions. Even if you make a mistake along the way, the SatNav will recalculate and still take you to the point. A GPS co-ordinate is just like a map reference, with two numbers defining the position: One defining how many degrees North of the equator we are, and another defining how far West of the Greenwich meridian we are. These might be defined in degrees and their decimal e.g. N54.514417, or degrees and minutes (where a minute is 1/60th of a degree) e.g. N54′ 30.865″. Some SatNavs let you select which format to use. There will be one number for North and one for West (or -East). 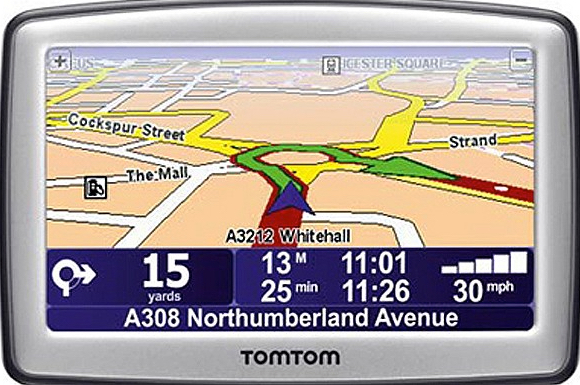 On your SatNav, you will find somewhere the ability to input a destination using co-ordinates. On your iPhone, if you simply put the two numbers into the search line, the map will find the location. Give this a go on your SatNav and see how easy it is to find the Bush. On your iPhone in Maps, type in the numbers in the search box as 54.514417 -6.723300 then search. The minus sign is needed before the 6 to tell the map we are West of the Greenwich meridian. With a little practice, this becomes pretty easy. It is a lot of fun when you get into it, and following the directions is easy. You will learn a lot about your SatNav in the course of this exercise!! When we get the date fixed, why not come along and give it a go!